Galespeed VRC (Variable lever Ratio Control) mastercylinders. Galespeed designed & developed "Variable lever Ratio Control" gives you wider lever ratio adjust range (0.25mm per click, 8 clicks/max. 2mm adjust range - *from supporting point to operating point* ), and helps you to find the most suitable brake feeling without being affected by different brake calipers. NOTE: Update to remoted adjuster cable and bracket using the parts listed below in the "Related Items Section"
Made from high-pressure forged aluminum materials, the setup allows for precise push rod to cylinder alignment on the handlebar. This in turn provides a more direct brake feel and control with less friction at the lever. All listings come standard with the “Short” lever pictured. Forged mastercylinder body Aluminum mastercylinder body is made by high-pressure forging, which realizes high-strength and light-weight. Radial-pump Push rod and mastercylinder is lined and placed in 90 degrees against handlebar, which gives you more direct brake feeling and fine braking. Variable lever ratio control Gale Speed original lever ratio control can adjust the lever ratio (from Point of Support to Point of Load) in 0.25mm per step, total 2mm at maximum. Folding lever blade When the bike is toppled over, the lever blade is folded for less damage on the mastercylinder. Power lever blade (straight lever blade for clutch mastercylinders). By improved the lever blade shape and gripping area, it achieved better grip control with less gripping power. Quick release handlebar clamp By loosing just one bolt, mastercylinder can be detached from handlebar. Galespeed / Active race parts are imported from Japan. 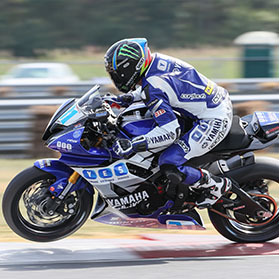 These extremely high quality components are used on the Graves spec Yamaha R6. We strive to stock the parts that we race with so inventory stock will show on the website. Special wait times apply when these parts go out of stock. Please call with any questions 855-994-0990. Thanks for your business.